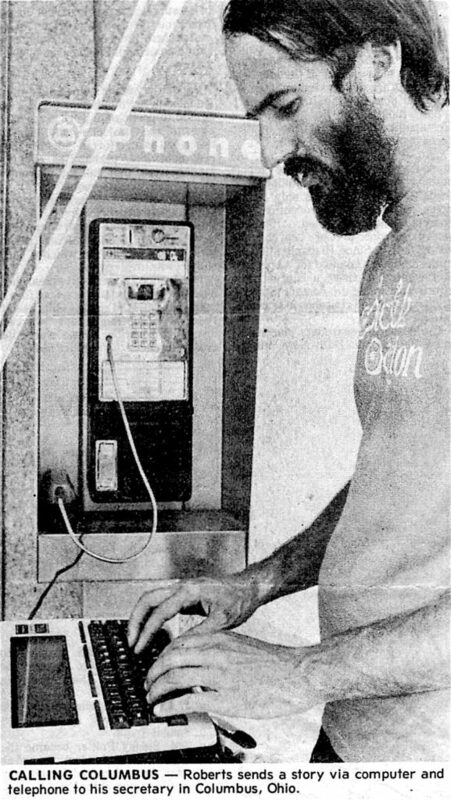 This 1984 article was in one of my unexpectedly favorite towns. All I knew about Hammond before arriving was a song by the Roches, but before long I had met a fellow cyclist who remains a friend to this day, over 3 decades later. I stayed for two or three weeks, relaxed, getting to know people… even taking a sabbatical to New Orleans. The visit became a chapter in Computing Across America. 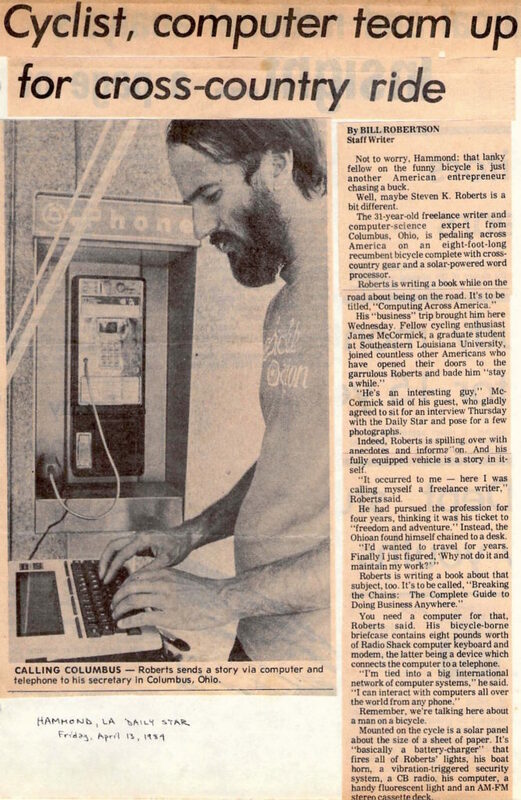 The writer picked up on the Model 100 computer that connected me to CompuServe, featured in the opening photo. Not to worry, Hammond: that lanky fellow on the funny bicycle is just another American entrepreneur chasing a buck. Well, maybe Steven K. Roberts is a bit different. The 31-year-old freelance writer and computer-science expert from Columbus, Ohio, is pedaling across America on an eight-foot-long recumbent bicycle complete with cross country gear and a solar-powered word processor. Roberts is writing a book while on the road about being on the road. It’s to be titled, Computing Across America. “He’s an interesting guy,” McCormick said of his guest, who gladly agreed to sit for an interview Thursday with the Daily Star and pose for a few photographs. Indeed, Roberts is spilling over with anecdotes and information. And his fully equipped vehicle is a story in it self. “It occurred to me — here I was calling myself a freelance writer.” Roberts said. He had pursued the profession for four years, thinking it was his ticket to “freedom and adventure.” Instead, the Ohioan found himself chained to a desk. Roberts is writing a book about that subject, too. It’s to be called, Breaking the Chains: The Complete Guide to Doing Business Anywhere. You need a computer for that, Roberts said. 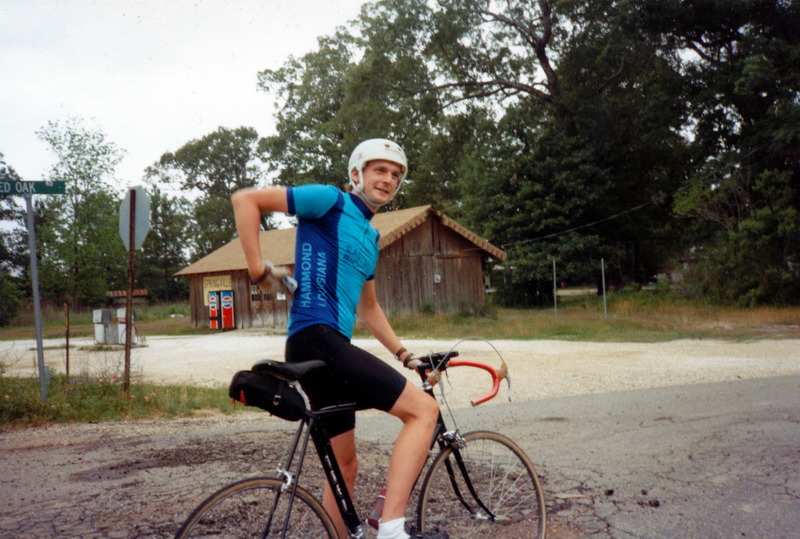 His bicycle-borne briefcase contains eight pounds worth of Radio Shack computer keyboard and modem, the latter being a device which connects the computer to a telephone. Remember, we’re talking here about a man on a bicycle. Mounted on the cycle is a solar panel about the size of a sheet of paper. It’s “basically a battery-charger” that fires all of Roberts’ lights, his boat horn, a vibration-triggered security system, a CB radio, his computer, a handy fluorescent light and an AM-FM stereo cassette deck. The tape deck doubles as a dictating machine. Picture Roberts whizzing down a country road, plucking thoughts from his head on the scenery or last night’s socializing in the town he just left, and verbally writing his book. Books, that is, and magazine articles. “You name it,” Roberts replied, when asked what he writes about. The subject may be prison inmates, a chance encounter with rednecks in Mississippi or other such vignettes from the cycle saddle. Simply put, what Roberts does is plug his computer into the nearest telephone, dial up his secretary in Columbus and punch in his story. She gets it down on paper via another computer in Roberts’ office and makes sure the article reaches the right market. Roberts said he was doing just that on the second day of his trip, which began Sept. 28, 1983, in a little Ohio town named Christianburg. Up came a dusty farm truck carrying a dusty old farmer. 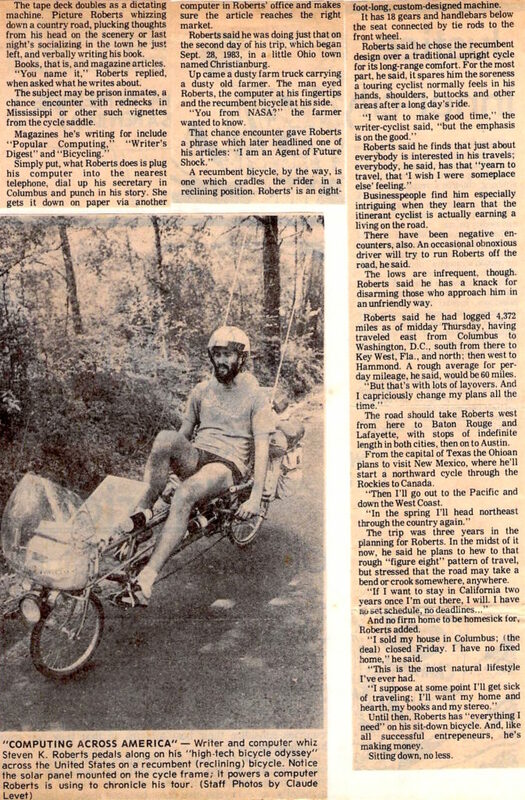 The man eyed Roberts, the computer at his fingertips and the recumbent bicycle at his side. “You from NASA?” the farmer wanted to know. A recumbent bicycle, by the way, is one which cradles the rider in a reclining position. Roberts’ is an eight- foot-long, custom-designed machine. It has 18 gears and handlebars below the seat connected by tie rods to the front wheel. Roberts said he chose the recumbent design over a traditional upright cycle for its long-range comfort. For the most part, he said, it spares him the soreness a touring cyclist normally feels in his hands, shoulders, buttocks and other areas after a long day’s ride. Businesspeople find him especially intriguing when they learn that the itinerant cyclist is actually earning a living on the road. There have been negative encounters, also. An occasional obnoxious driver will try to run Roberts off the road, he said. The lows are infrequent, though. Roberts said he has a knack for disarming those who approach him in an unfriendly way. Roberts said he had logged 4,372 miles as of midday Thursday, having traveled east from Columbus to Washington, D.C., south from there to Key West, Fla., and north; then west to Hammond. A rough average for per-day mileage, he said, would be 60 miles. The road should take Roberts west from here to Baton Rouge and Lafayette, with stops of indefinite length in both cities, then on to Austin. From the capital of Texas the Ohioan plans to visit New Mexico, where he’ll start a northward cycle through the Rockies to Canada. The trip was three years in the planning for Roberts. In the midst of it now, he said he plans to hew to that rough “figure eight” pattern of travel, but stressed that the road may take a bend or crook somewhere, anywhere. And no firm home to be homesick for, Roberts added. “I sold my house in Columbus; (the deal) closed Friday. I have no fixed home,” he said. “This is the most natural lifestyle I’ve ever had. Until then, Roberts has “everything I need” on his sit-down bicycle. And, like all successful entrepeneurs, he’s making money.